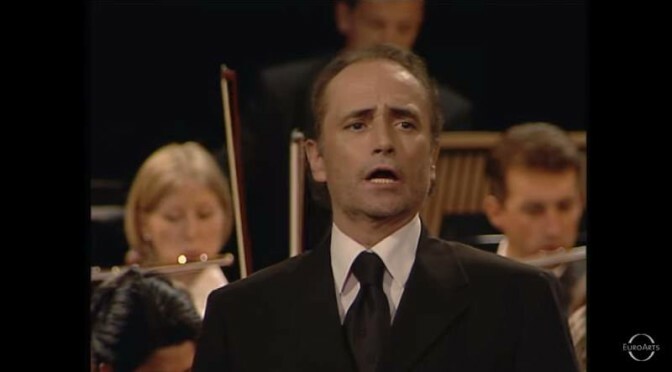 Famous Spanish tenor José Carreras sings “Kumbaya my lord”, an Angolan spiritual song, first recorded by an out-of-work English professor, Robert Winslow Gordon, in 1927. Carreras and the Vienna Symphony Orchestra perform at the Schönbrunn Palace in Vienna. Additional singers: Joan Orleans, Gary Lux, Bernhard Rabitsch, Patricia Graf-Simpson and Sandrine Rohrmoser. Robert Winslow Gordon went on a search for black spirituals and recorded a song “Come by Here, My Lord”, sung by H. Wylie. The song was sung in Gullah on the islands of South Carolina between Charleston and Beaufort. Gullah is the creole language featured in the Uncle Remus series of Joel Chandler Harris and the Walt Disney production of Song of the South. “Come by here, my Lord” in Gullah is “Kum by (h)yuh, my lawd”. American missionaries took the song to Angola after its publication in the 1930s, where its origins were forgotten. In the late 1950s the song was rediscovered in Angola and returned to North America where it swept the campfire circuit as a beautiful and mysterious religious lyric. That is why the song is associated with Angola in many current printed versions. In the US, however, the song was associated with Boy Scouts, Girl Scouts, and other campers sitting around a campfire in perfect harmony. The picture of a warm, cozy community without conflict associated itself with the song and especially that foreign-sounding word in its title, kumbaya. Since the word had no actual meaning in English, cynics eventually converted this harmless connotation into the actual English definition of the word. For all that’s true, for all you do. For all that’s real, for all we feel.